As soon as I saw this picture, I knew I would be incorporating the recipe into my tailgate repertoire. The Barbecue sundae is a masterpiece of layered beans, coleslaw and pulled pork. All topped off with a dollop of BBQ sauce and a dill pickle. 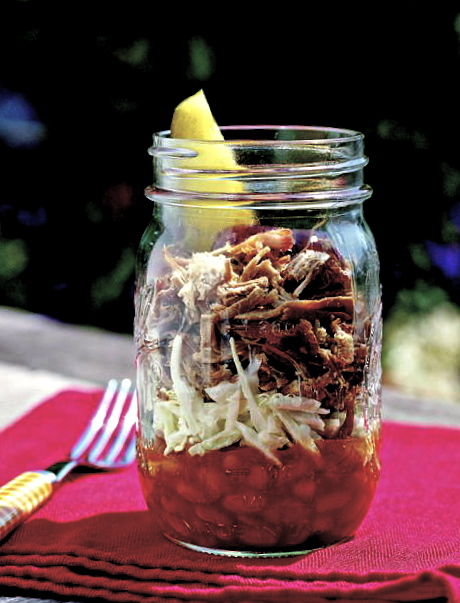 Brilliantly served in a mason jar, makes this recipe perfect for tailgating. The sundae captures so many things that I love about the south - great food, simplicity and inventiveness. The sundae was first created by the Rebel Barn restaurant in Oxford, Mississippi. The Rebel Barn is sadly now closed, but patrons are still making the recipe and so the tradition lives on. The recipe and more information can be found at the Jones is Hungry blog, which is a great blog by the way. Happy Tailgating!